The Otho Graphic Liner is a roller ball pen with pigment ink that is both water proof and fade proof. There is a line width for everyone, 0.3mm to 1.5mm. The 0.5mm is my favorite as it is ultra smooth while still laying down a fine and sharp line. The Graphic Liner feels a bit like a porous tip fine liner with the smooth ink flow and a bit like a roller ball with the hard metal tip; it’s a great combination. The O.3mm is a little more needle-like than I prefer but it is still smoother than most 0.3mm pens I have tried, including the Pilot Hi-Tec-C gel pen. These pens are labeled with numbers that correspond to their various line widths, however they aren’t labeled in millimeters, instead the 0.3mm is a 005 and the 0.5mm is a 02 so be careful when you purchase. The Graphic Liner isn’t the most attractive with it’s black body and orange accents. The clip is strong and functional. 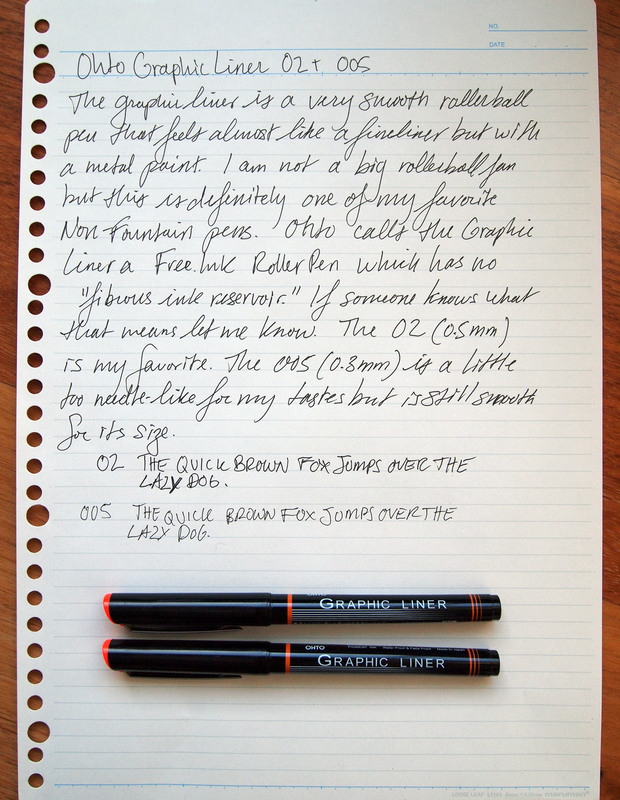 Otho classifies the Graphic Liner as a “free ink roller pen”, meaning that the pen has no “fibrous ink reservoir” (if anyone knows what that actually means please let me know). 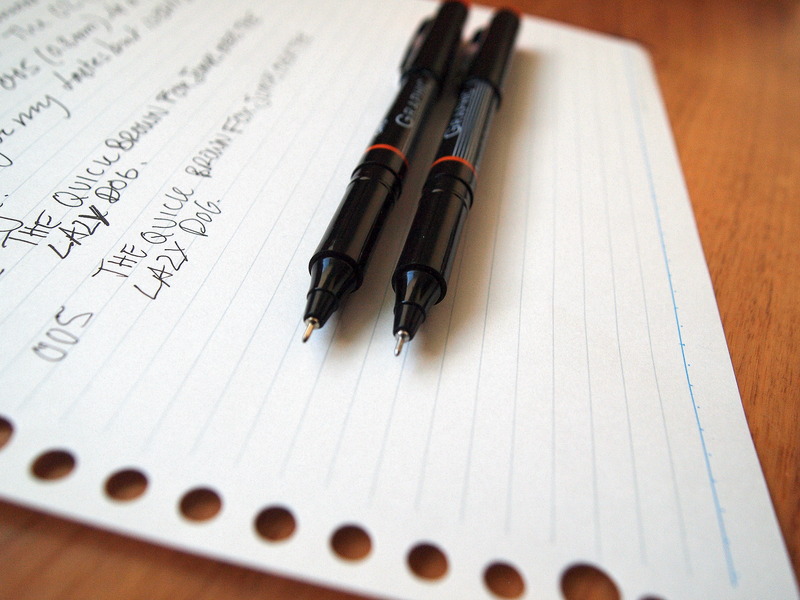 The Graphic Liner only comes in black but Otho makes other free ink roller pens that come in multiple colors, so I will definitely be giving those a try. At $2.50 ($2.65 for the 005) I highly recommend it; it is easily one of my favorite non-fountain pens. If I had to guess, I’d say “no fibrous ink reservoir” means no feed material regulating the inkflow, that the Graphic Liner’s ink is gravity fed rather than depending on capillary or osmotic action. For this to work, the tolerances of the roller tip and the viscosity of the ink would have to be closely considered (and the ink pressurized as well?). If this is correct, you would find nothing but an empty chamber of ink behind the tip inside a spent Ohto were you curious enough to cut one open or pull it apart. Or maybe instead of a felt material (“fibrous”), you would find a louvered plastic insert behind the needlepoint which would blow my theory of a purely gravity-fed rollerball all to hell. That’s interesting. Thank you for the explanation. When I run out of ink I will have to try and cut one open and see.